You are here: Home > Now Available: The Complete Guide to Spring Training 2018 / Arizona! Now Available: The Complete Guide to Spring Training 2018 / Arizona! Now available for pre-order: The Complete Guide to Spring Training 2018 / Arizona! The 232-page book is scheduled to be printed and shipped to our offices this week, which means it will go out to you next week. We have kept the price at $19.99, and we are still throwing in free shipping as part of the deal! The print edition is only available from August Publications. 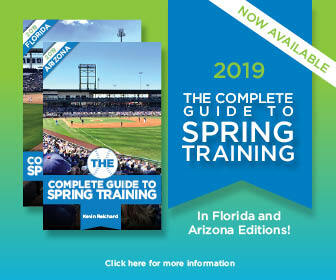 You can order The Complete Guide to Spring Training 2018 / Arizona here. This book covers the 15 Cactus League teams playing out of 10 training camps: Camelback Ranch-Glendale (Chicago White Sox, Los Angeles Dodgers), Goodyear Ballpark (Cincinnati Reds, Cleveland Indians), Hohokam Stadium (Oakland Athletics), Maryvale Baseball Park (Milwaukee Brewers), Peoria Stadium (San Diego Padres, Seattle Mariners), Salt River Fields at Talking Stick, (Arizona Diamondbacks, Colorado Rockies), Scottsdale Stadium (San Francisco Giants), Sloan Park (Chicago Cubs), Surprise Stadium (Kansas City Royals, Texas Rangers), and Tempe Diablo Stadium (Los Angeles Angels of Anaheim), as well as Phoenix Municipal Stadium, home of the Arizona State University Sun Devils. Also covered: exhibition games in Las Vegas and Montreal. College games: create your own day-night doubleheaders! This 232-page book has been totally revamped for spring training 2018, with pricing, ballpark offerings and information updated. As noted, this book is available only from the augustpublications.com website. Also available: the eBook version in Amazon Kindle, B&N Nook and Apple iBooks formats. We’ve also lowered the price to $3.99, and it’s available from the augustpublications.com website as well as Amazon, Barnes and Noble and Apple iBooks.